So I was surfing last night and the following add caught my eye – not so much because I was looking for “someone special”, I already have someone very special, but rather the location and numbers caught my eye. 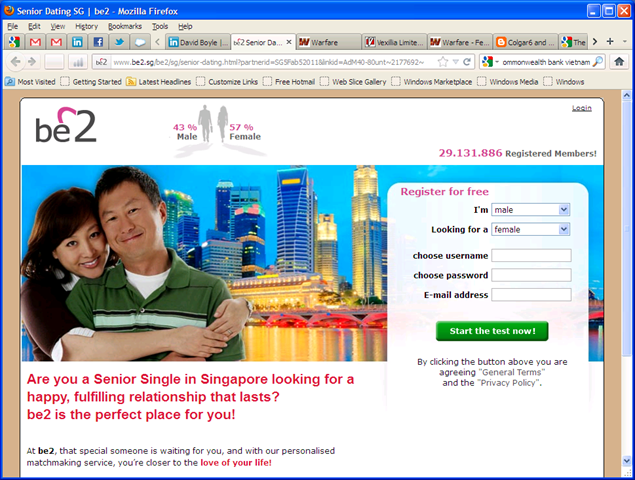 be2 is extolling its virtues for Singaporeans to find their perfect mature partner (I guess that means 30-over in Singapore speak) by simply registering. It noted 43% male members and 57% females (there is something in that itself). The classic number was 29,131,886 registered members. My goodness, that is huge especially as Singapore only has about 6,000,000 people living in it and I am sure that some of those are under 30. I guess everyone joins here 6 times to get the numbers up!